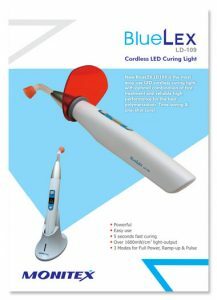 Designed with powerful light intensity, the BlueLexLD-109 curing light is able to reach 1600mW/cm² for fast and efficient results. Achieve complete polymerisation of most composites within 10 seconds. Cordless, ergonmic lightweight design allows for full freedom of motion for optimal curing results. Full Power Mode for optimal high speed polymerisation. Ramp-Up mode. Select this option to reduce composite shrinkage during polymerisation. Light intensity gradually increases to full intensity. Pulse Mode. The unit will pulses between off and on every half a second to reduce the heat output.